Painted Turtle Basking in the Sun / Evolution; Do We Need to Know? 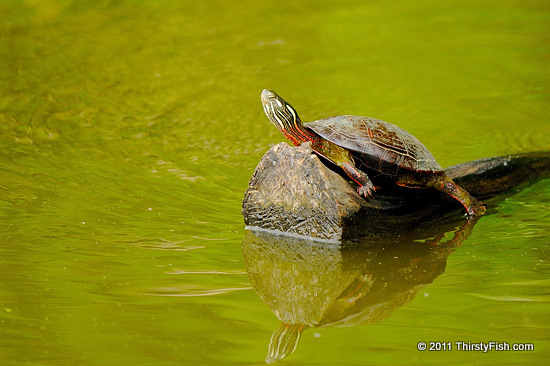 The Painted Turtle is active only during the day and can often be spotted basking for hours on logs or rocks. Painted Turtles, much like other reptiles are cold-blooded and have to rely on their surroundings for heat. During winter, they hibernate in the muddy bottoms of waterways. Native only to North America, Painted Turtles are portrayed as tricksters in traditional Native American tales. They first appear in the fossil record 15 million years ago. The fossil record, genetic evidence, geological findings, observations of natural selection and mutation, radiocarbon dating, etc. all make the case for Evolution, yet the United States ranks next to last in acceptance of The Theory of Evolution among Western countries. Only about 40% of Americans believe it to be True while an equal number believe it to be False (2005). Why is belief in the truth or facts important? Is it important? If Evolution is a fact, does belief in it qualify the life of any of us? Just like most of us do not need to understand how a cell phone works, why do we need to understand how and whether evolution works? Do we need to know?